The Upper Hudson Maple Producers Association will once again host Maple Open House Weekends, March 23, 24, 30, and 31, allowing the public to take a free tour of area sugarhouses and see maple syrup made onsite. Families are invited to experience first-hand the sights, smells and sounds of maple sugar-making. Past events have been so successful they have been expanded to multi-weekends, giving more opportunities to visit sugarhouses. Signs will be placed along roadsides over the course of the weekends to direct motorists to the sugarhouses. The sugarhouses will be open from 10 a.m. to 4 p.m. each day. Most sugarhouses will offer samples and demonstrations. Many of the locations will be serving pancake breakfasts as well. Maple season generally runs from now through the beginning of April. The Upper Hudson Maple Producers Association is a trade organization representing maple producers in Washington, Warren, Saratoga, Montgomery, Fulton and Rensselaer Counties. The Upper Hudson region is among the biggest syrup producing areas in New York State. 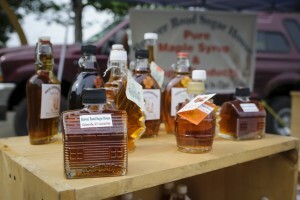 To find more information about the event, local sugarmaking, and maple recipes, visit www.upperhudsonmaple.com.